My mom used to have one, made out of just ordinary material…One pocket has threads, another pocket has a thimble, another pocket has scissors, and then it’s folded and tied, and you roll it. 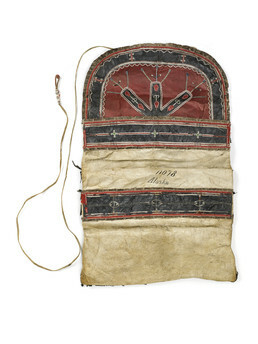 This handsome roll-up bag was sewn from white-tanned seal esophagus, decorated with red and black-painted esophagus and caribou hair embroidery. It has a pouch, a rounded flap, and a braided sinew cord that wraps around the bag when it is rolled up. Women used this type to hold sewing notions and men carried them as hunting bags to hold rifle cartridges, knife sharpeners, and other small tools. Mary Bourdukofsky: It’s either a hunting or a sewing bag. . . My mother used to have one. She used to keep her [sewing materials]. [One] pocket has thread, another pocket has a thimble, another pocket has scissors, then it’s folded and tied, and then you roll it up . . . and it’s easier to [carry]. . . . For hunting, they could use it for their knives, knife sharpeners, maybe bullets – you name it. Aron Crowell: So men had them too? Mary Bourdukofsky: Yes. Men had them, and women had them too. Aron Crowell: What would be the Unangax^ name for this object? Mary Bourdukofsky: Aaluum missuka [sewing bag]. Aron Crowell: So it has two different names. It is mayag^in missuuka for a man’s hunting bag. Mary Bourdukofsky: Yes, and aaluum missuuka for a woman’s sewing bag. Maria Turnpaugh: I just can’t get over that stitching. . . . [It looks like] machine stitching. Daria Dirks: I wonder who did that. It’s so tiny! Mary Bourdukofsky: The whole bag is made out of leather and embroidered with cotton and yarn. Aron Crowell: Do you have any idea what that leather could be? It’s really thin. Mary Bourdukofsky: I think its caribou, moose, or reindeer. They get thin if you take the blubber of and then take the hair all off . . .
Vlass Shabolin: Yeah, or a young reindeer. Maria Turnpaugh: They did get reindeer skins from somewhere. Mary Bourdukofsky: This looks like a reindeer skin.